Tomorrow I will be showing some of the project I've been working on in the office to the boss. I didn't want to have overly obnoxious colors for that, so I used a pretty navy and a little bit of fleck. The navy is Road House Blues (OPI). The flakies came from Flashy (Finger Paints. For a little difference, I used a matte top coat from NYC. Simple Simon! Ooh nice and simple! 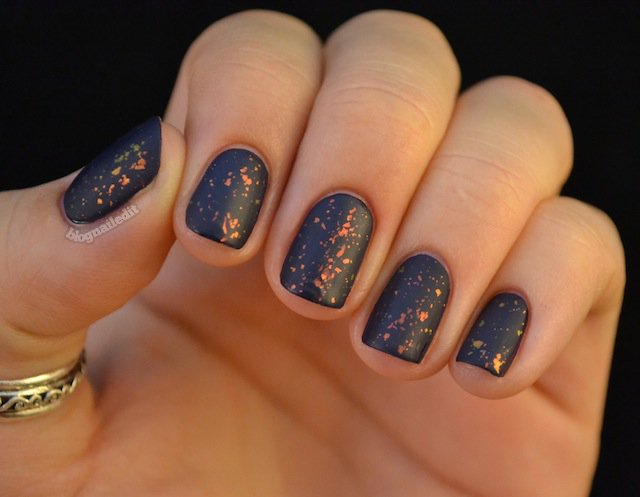 I love the matte look! This is so pretty and elegant. I love this! I have a question... (I have never tried matte polish.) does an actual matte polish and a regular polish with a matte top coat, end result actually look the same???? this would be a cool comparison! Awesome question! Unfortunately, I'm the wrong one to ask. I don't actually own any matte polishes, just matte top coats. I imagine that is the case though. Just as I assume applying a shiny top coat to a matte polish would make it appear as if it were shiny in the first place. hmmm....I have heard that matte polishes chip faster.. so that has made me NOT wanna buy one.. maybe one day I'll buy one JUST to try :) thank you tons! LOVE LOVE your blog! I love this! Where can I buy "flashy"? It was a limited edition flakie from Finger Paints. It's no longer available sadly. So simple but so pretty! I really love mattified flakies and glitter.